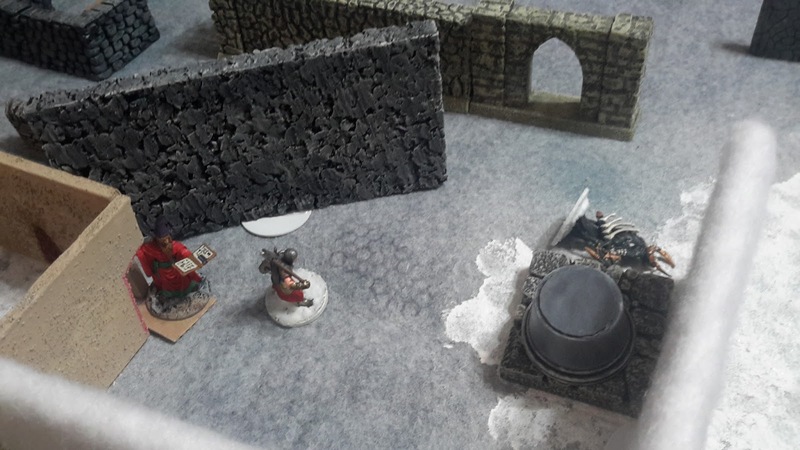 Frostgrave Campaign 2017 Game 8: Who Closed the Door? | H.A.W.K.S. 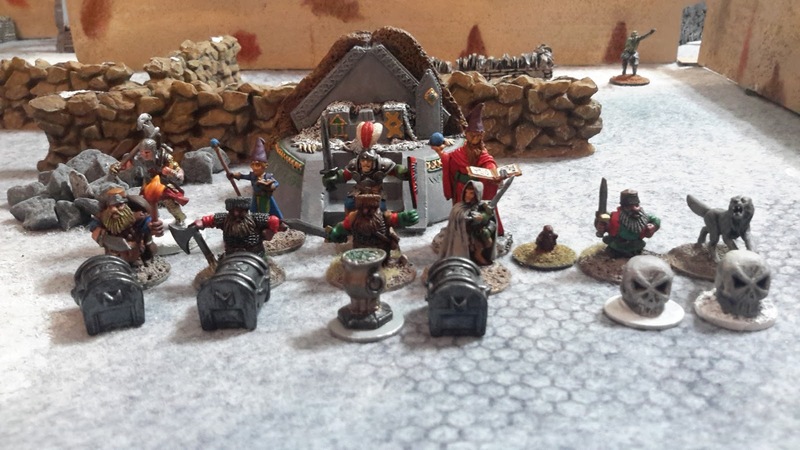 Frostgrave Campaign 2017 Game 8: Who Closed the Door? 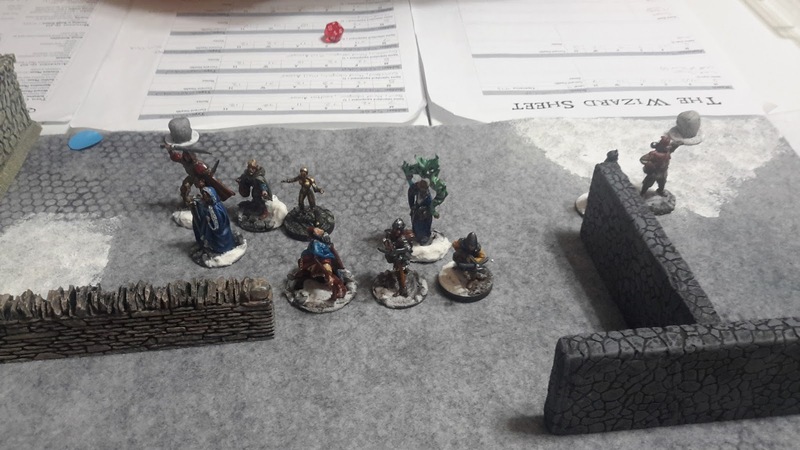 This past Saturday our gaming group got together to continue our 2017 Frostgrave campaign based on the “Thaw of the Lich Lord” supplement book. 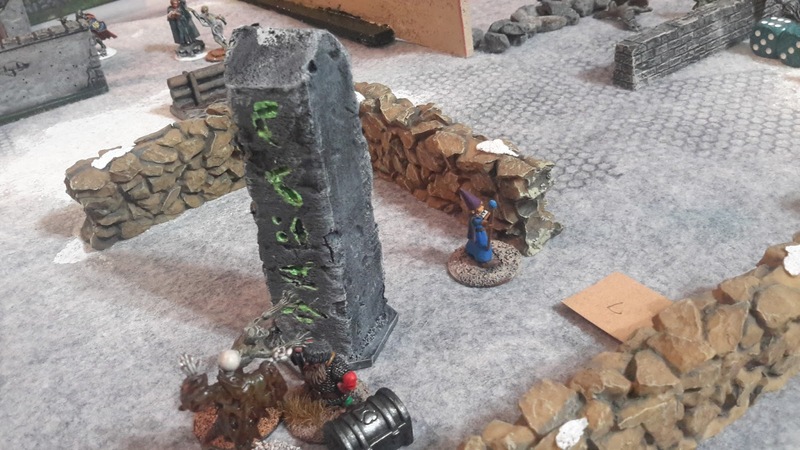 This month’s game was the Lair of the Ghoul King scenario. We had several cancellations due to real life and only had five of our nine players available. So we modified the scenario to add an additional throne. We placed the treasures and trap doors and then diced off for set-up locations. 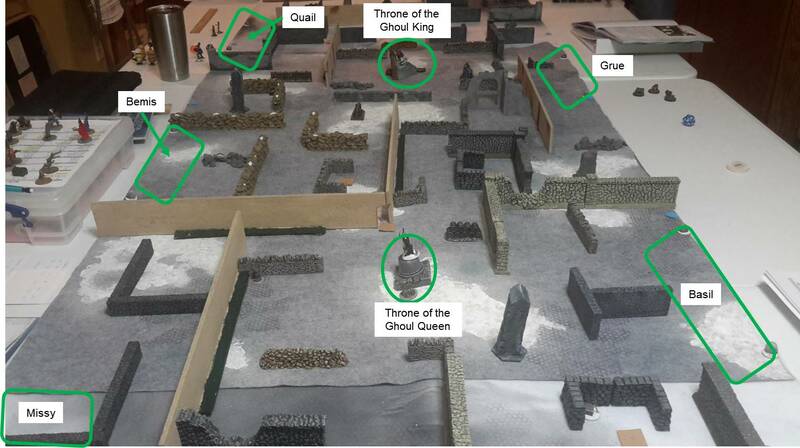 You can find my fellow Sigilist’s report here: The Lair of the Ghoul King & Queen for additional information about the game set-up plus another perspective of what happened. "Mawahaha!!!! Puny human, you are now my servant. You will serve me for a thousand years" and with that, Bemis suddenly awoke from a deep sleep. “Just a dream” he said to himself but still he wondered if it was a portent of the future. The night before heading into an unexplored section of Felstad was not the time to have weird thoughts. Well, dawn was not far away, maybe a spot of tea would help. Soon the rest of the group would be awake. Under Nigel’s supervision, the lads prepared their kit to enter the frozen city. Bemis and Agarn busied themselves in the lab. Bemis successfully prepared a Scroll of Reveal Secret and Agarn a Scroll of Dispel. After brewing up some tea, they both turned their attention to brewing potions. After several failed attempts that produced some nasty smelling liquid, Bemis decided they’d had enough (Both failed their Brew Potion spells). Bemis managed to summon his beaver Familiar named Leavittoo. Agarn was not successful calling his Familiar. Bemis then turned his attention to the staff they had discovered on their last trip. After careful examination, Bemis determined it would enhance the casting of the spell Circle of Protection (forgot to roll for the staff at the end of the last game). Which preparations complete, Bemis and his band of adventurers headed out into the chill of the morning air. As the warband approached the ruined monastery, Bemis noted Quail’s warband heading in the same direction. 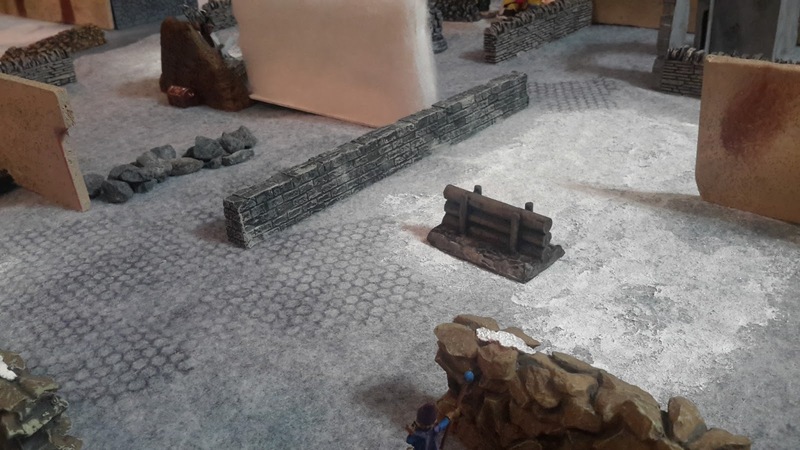 “Pick up the pace, we must beat Quail to the entrance” Bemis ordered as they quickly moved forward to secure their entry point (Bemis had the fourth pick of starting locations ahead of Quail who got the leftover spot). As they descended underground, Bemis thought it odd that the entrance way was not filled with at least some debris. “Were they not the first ones to enter?” pondered Bemis. And when they reached the bottom and the door easily swung open Nigel (Captain) said “I’ve got a bad feeling about this, look sharp lads." And with that the warband cautiously went inside. 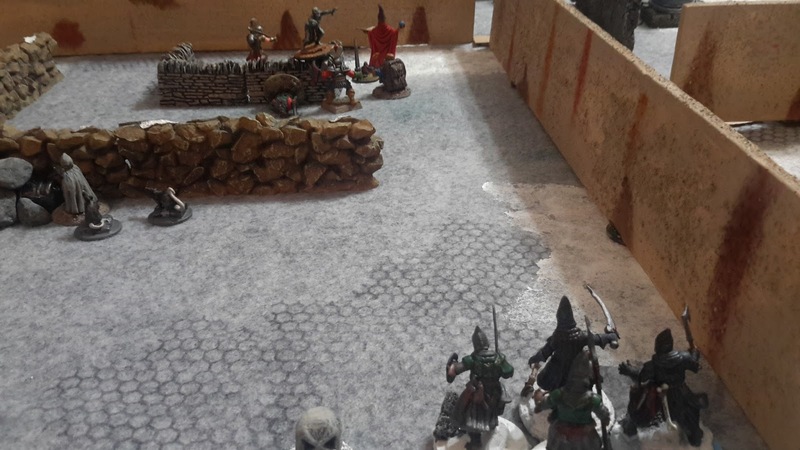 As soon as the last of the warband entered, the door slammed shut behind them, and then disappeared. "ITS A TRAP” cried Agarn. “Mr. Agarn, sir, be quiet now will you; there’s a good apprentice. You’ll upset the lads.” Nigel replied, putting a hand on Agarn’s shoulder to calm him down. Bemis decides to make things a bit harder for his rivals and casts Draining Word – Telekinesis. 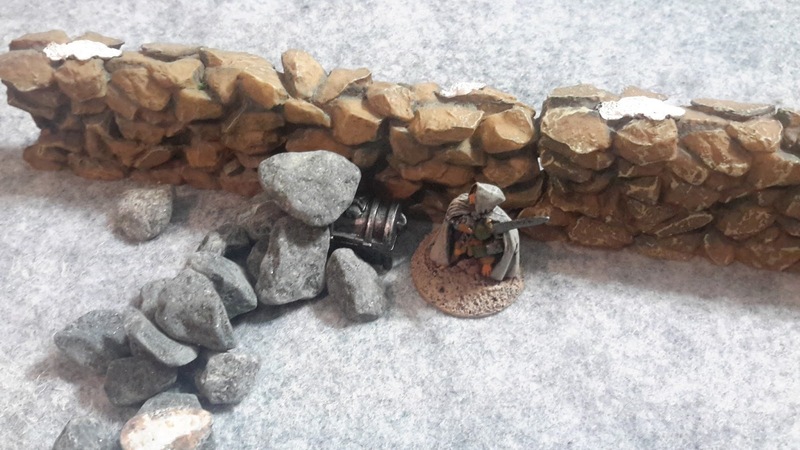 Even though visibility was already pretty bad (Line of sight restricted to 12 inches), Agarn cast Fog to protect the left front of the warband. 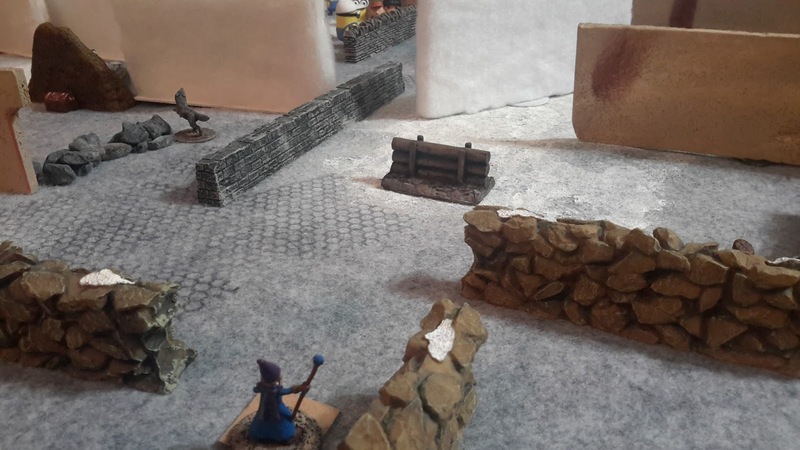 The rest of the warband spreadout a little to search for treasure – and a way out. As usual, Shadow (Warhound) goes running off (Probably looking for some Scooby treats). 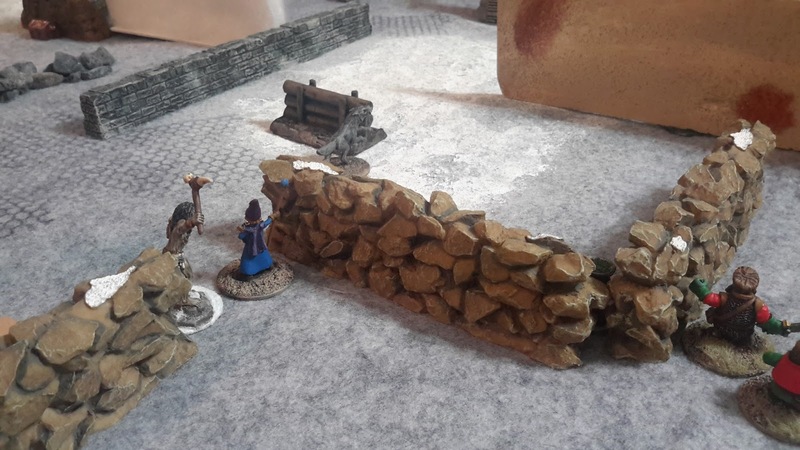 Bemis directs Hatch (Thief) to search through some fallen rocks for the ancient tome revealed to him earlier while casting Reveal Secret. Suddenly two trapdoors in the floor burst open as a ghoul emerged from each one. “Oh, this will be fun” thought Vale (Treasure Hunter) as his Axe (Sword) of Undead Slaying started to glow. Agarn found himself facing a ghoul without any backup. Luckily he remembered his many hours of training with Nigel and easily took out his opponent. He then moved over and stood on top of the trap door hoping that would prevent additional ghouls from appearing. Nigel and 9Toe (Treasure Hunter) move to engage the other ghoul just as it knocks Piko to the ground. Nigel easily slays the ghoul. 9Toe moves around a stone wall to look for treasure. Diesel Vin (Treasure Hunter) moved up quickly and stuck his head out a doorway to look around. His eyes were drawn to fancy throne. ZAP!!! An Elemental Bolt cast by Basil’s apprentice struck him squarely in the head dropping him to the dusty floor (That’ll leave a scar!). Niko (Thief) and Kleppo (Thief) both manage to find some treasure and quickly place the items in their backpacks. Searching through the rock, Hatch discovers a leather parcel and places it in his pack as well – just in time to be assaulted by a pair of large rats. He barely manages to fight both of them off by wildly swinging his dagger. Agarn, feeling a bit exposed, decides to cast another wall of Fog to cover him position. He was getting a bit worried as he had heard Shadow barking off in the distance, followed by a sharp “yelp”. Unbeknownst to Agarn, Shadow had been cruelly cut down by Quail’s crosbowman (Nicknamed Puppy Slayer). As Agarn was nervous looking around, he noticed a strange eye materialize on a wall to his front (Grue’s apprentice had cast Wizard Eye for some nefarious purpose). “That can’t be good” he thought as the eye seemed to stare at him. He quickly attempted to cast Dispel but his tongue tripped over the words causing the spell to sputter. He pulled out a Dispel scroll, easily read the words, and eye vanished. 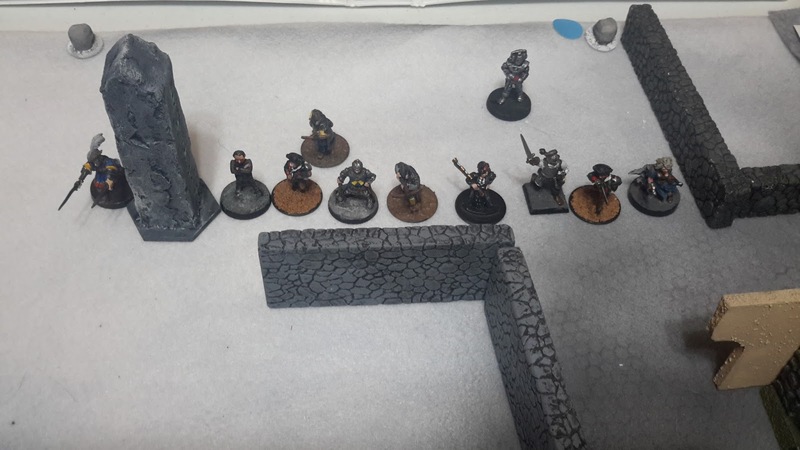 Popping through a hidden door, four death cultists appeared behind Bemis and his warband (an unfortunate random monster roll by one of my opponents). Thinking qickly, Bemis picked up a small rock from the floor and incanted the words for the Grenade spell. Being successful, he then flung it towards the cultists. 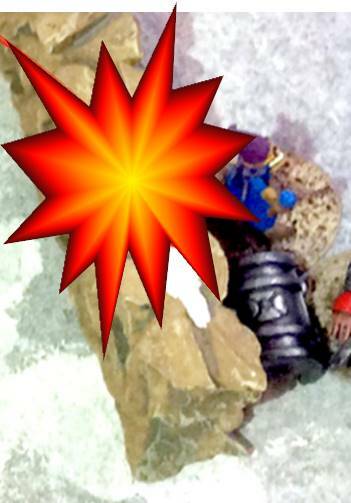 The grenade landed in their midst, showering them with rock splinters causing some damage but not enough to slow them down. 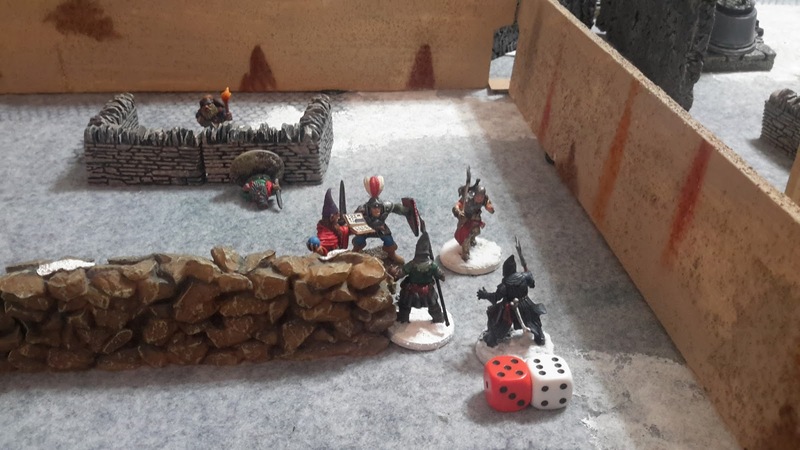 Hatch easily defeated the two rats and quickly hopped over the wall to hide from the cultists. Another ghoul came through a doorway and charged towards Nigel. Nigel easily bested him and quickly cut him down. He then turned around to face the cultists charging toward him. 9Toe picks up a small chest and turns to move back towards Nigel. 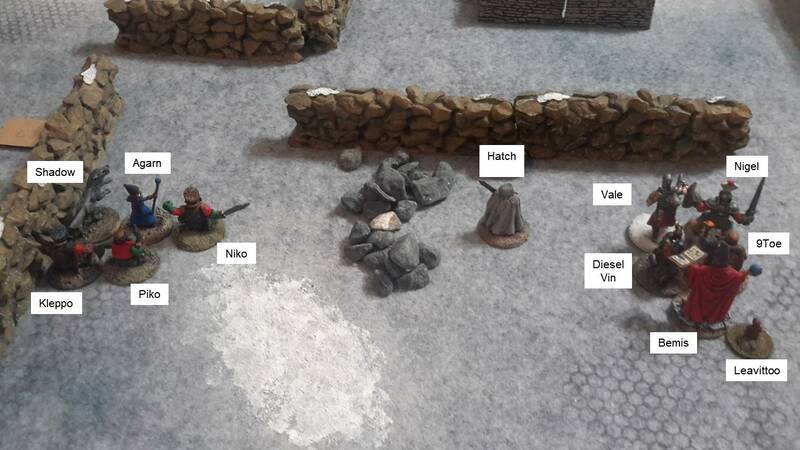 Bemis manages to fling another Grenade at the group of cultists as they charge forward but sadly it does little damage. 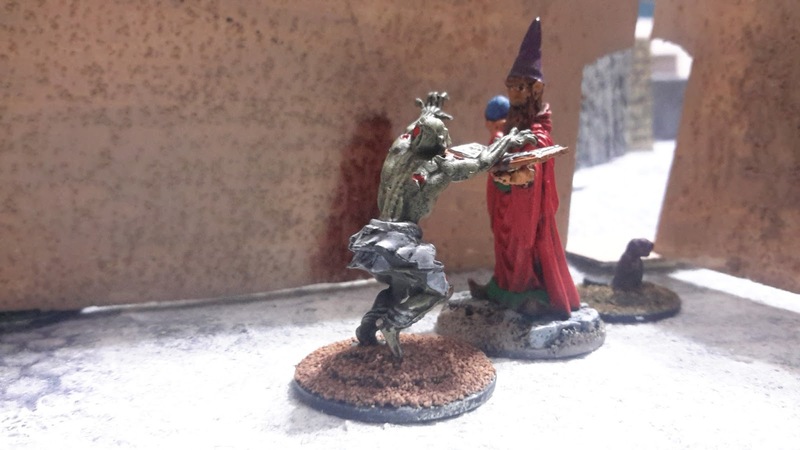 Nigel engages in a whirling duel with one of the cultists. Vale easily drops one cultist with a single swing of axe. 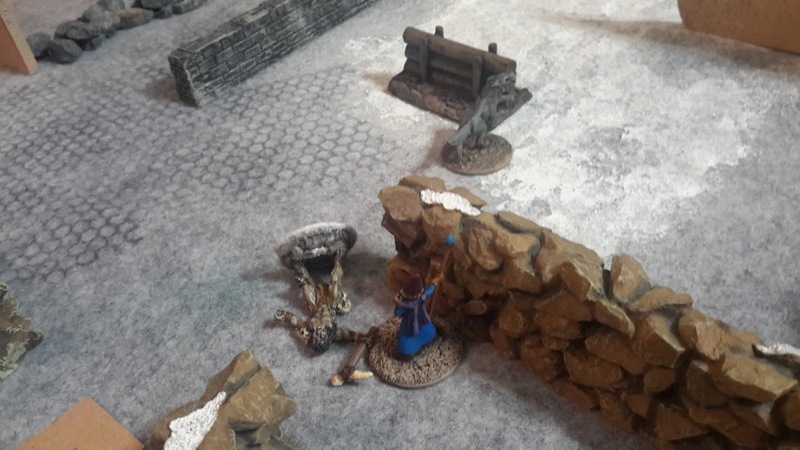 Even old man Bemis manages to strike down a cultist much to the bewonderment of his warband members. cultists and somehow manages to kill them both. Meanwhile, ghouls continue to appear. Vale and his Axe of Undead Slaying found themselves very busy. He engaged several ghouls, some singlehandedly, and some in partnership with Nigel. The end result was three more dead ghouls. A door in the far wall slowly creaked open. Expecting the worst, Agarn moved over to stand beside Kleppo who was hiding behind a wall. Just as he got there, Kleppo pushed him to the ground yelling “Incoming." Up on top of the wall, an Explosive Cocktail exploded. It must have just been a large firecracker because neither of them sustained any damage, except a slight ringing in the ears. Kleppo cautiously peered around the corner. He saw Quail’s young apprentice off in the distance, kneeling on the floor sobbing. "Eh, nothing to cry about lassie, you missed. It happens” he thought as he turned and helped Agarn stand up. “That wasn’t very nice, girls are mean. Look, there’s a hole in my hat” Agarn exclaimed as he picked up his purple pointy hat. “Aye, lad, sometimes they can be but wait ‘til you get older” said Kleppo. Kleppo was about to say more but two ghouls suddenly dropped from the ceiling beside him (My fellow players are so kind, I must remember to repay them). “Run lad” he yelled to Agarn. Agarn stopped to throw a grenade. As he rushed to get the spell cast, he misspoke the words and the spell failed to materialize. He quickly ran out as directed. Holding a small treasure chest in one hand, Kleppo managed to fight off both ghouls. Beating them back, he too turned and quickly ran out of the area to join the others. While this was happening, Vale moved up and glanced through an archway. He could see a large throne, plus the crumpled body of Diesel laying on the floor. He appeared to be breathing. Vale called to Bemis who also moved up a bit. Vale pointed at the throne, “I’ll like to go check it out." Bemis nodded and cast a wall of Fog to cover his movement. Once he got to the throne, Vale searched around quickly. He saw the smoldering body of the Ghoul Queen laying on the throne as well as a series of levers. He decided to pull one. As he did so, he a loud "Woohoo” from the other room (A door had opened near the warband). Bemis said to Vale, “Good job, a door has opened. Lets go…and grab Diesel." As Bemis turned, he found himself staring into the dead eyes of a ghoul (Courtesy of one of my fellow players). He quickly fought him off and moved towards the exit. Everyone quickly leaves the underground chamber, glad that they survived. All except Shadow, who Agarn said wouldn’t be making it out. 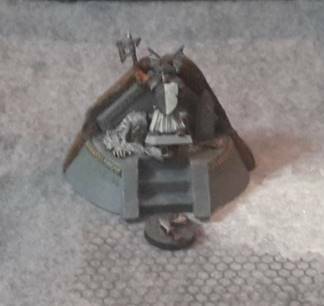 It was a travesty to leave his body there, no telling what foul experiments the undead creatures might perform on his corpse. Bemis was extremely happy with the four treasures his warband recovered, each yielding a grimoire: Furious Quill (the one previously revealed to Bemis), Wall, Raise Zombie, and Leap. He increased his knowledge and understanding by scanning through them and some other interesting material in his library (Successfully cast Absorb Knowledge). Selling the duplicate grimoire (Wall) for 250 gold added to the 280 gold from the four treasures was a nice haul (after subtracting 63 gold for Nigel’s pay). Diesel and Piko should make a full recovery in a few days, Shadow would have to be replaced, maybe by a dog that doesn’t go running off all alone. Another great and challenging scenario completed. It could only have been better if our missing players had been able to make it. 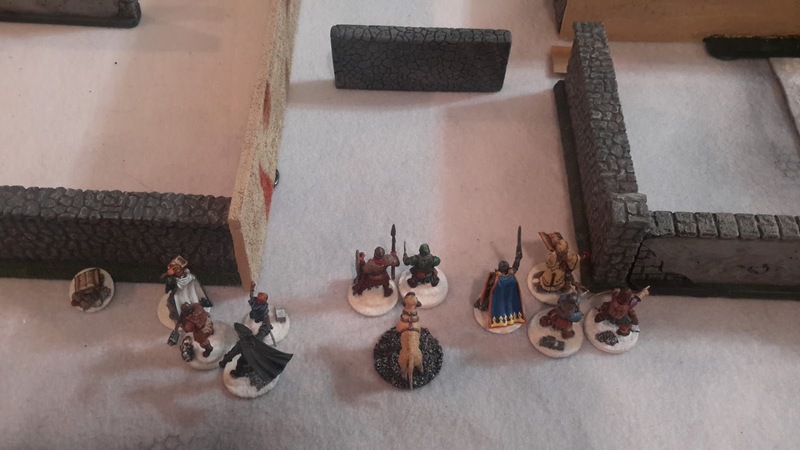 The limited line of sight, the randomly appearing ghouls from the trap doors, and the player placed ghouls made things interesting. Bemis made out well gathering four treasures and gaining four levels in experience. Nigel gained 50 points of Captain’s experience as well, he should gain another level after the next outing. 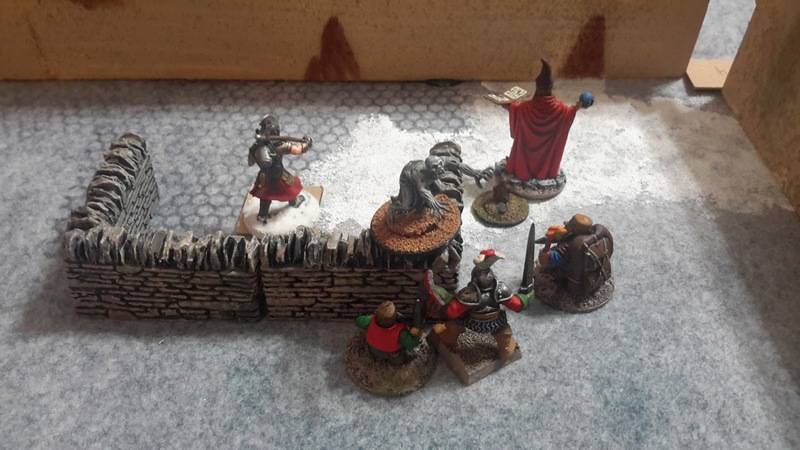 Already looking forward to the next scenario…..Agarn will be seeking an opportunity to even things up with the petulant Bailey for the damage done to his purple pointy hat. And Grue will be bringing bagels for breakfast.